Restoration of a Hand Powered Carousel Roundabout Just before Christmas we where asked if we would like to be part of a project to restore a hand powered carousel roundabout. 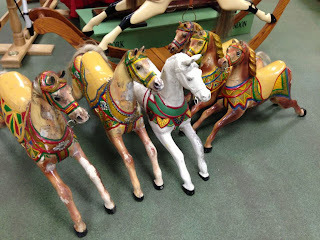 We have restored the odd carousel horse before but never a full set of Gallopers, as you can imagine we where delighted to be part of the restoration. Our job, obviously, is to restore the Gallopers back to as near as original as possible. This is the first of the six horses and is the one which has had the most changes to it over the years, the saddle at the back has been taken off and the mechanism in the middle of the horse (for attaching to the roundabout) has been removed, in fact we think it may even have been attached to a base, maybe made into a rocking horse for kids at some point. Gerry has now removed the old paint, although once all the gloss paint and gesso was taken off the front left leg needed to be removed and will now have to be repaired. Sam has now added some pieces of wood in the joints and is carving them into place. He will also be adding a saddle hump, then the horse will need gessoing. I hope we will be able to find out some history about this roundabout and will keep updating our blog.